This is going to be a short post. My grandmother is here right now (watching a German movie a few metres away) and, despite knowing that we’re moving in a few weeks just to see her more, I feel like I need to spend every moment of this visit with her. I guess old habits die hard and I’m used to seeing her for a couple weeks at a time every year or two. Graham and I are going camping tomorrow, then it’s his brother’s wedding on the weekend. Since my sister’s wedding is the following weekend and I’m making the cake as well as being the only bridesmaid, it’s a bit busy right now, ha. These quinoa patties were hard to photograph and I almost didn’t post this recipe because of it. I put a picture on instagram and it received this overwhelmingly positive response, which encouraged me to share the recipe despite the less than usual number of photos. I can absolutely guarantee this recipe will work because I’ve tested it a dozen times trying to get the pictures right. This is the first recipe using eggs I’ve posted in a looong time, with the last one being exactly a year ago! (This zucchini cornbread.) Crazy. My diet has shifted a lot and is much more plant-based than it used to be, especially since I’ve tried to cut out dairy completely to help with some skin and digestive problems. So, quinoa patties. They are high protein but free of both beans and grains, and I promise they won’t fall apart on you. Eggs are amazing. These make a nice summery meal with some fresh veggies. The avocado tahini dip I ended up pairing with them is pretty neat, and a much better combo than the kiwi salsa I tried the first time (disgusting). If you’re a batch cooker and already have quinoa taking up space in the fridge, this recipe will come together even faster. There’s lots of parsley in the patties and they taste fresh and light with the chard and herbs. They seem like they won’t fry up properly when you first mix them, but trust the magic of eggs. 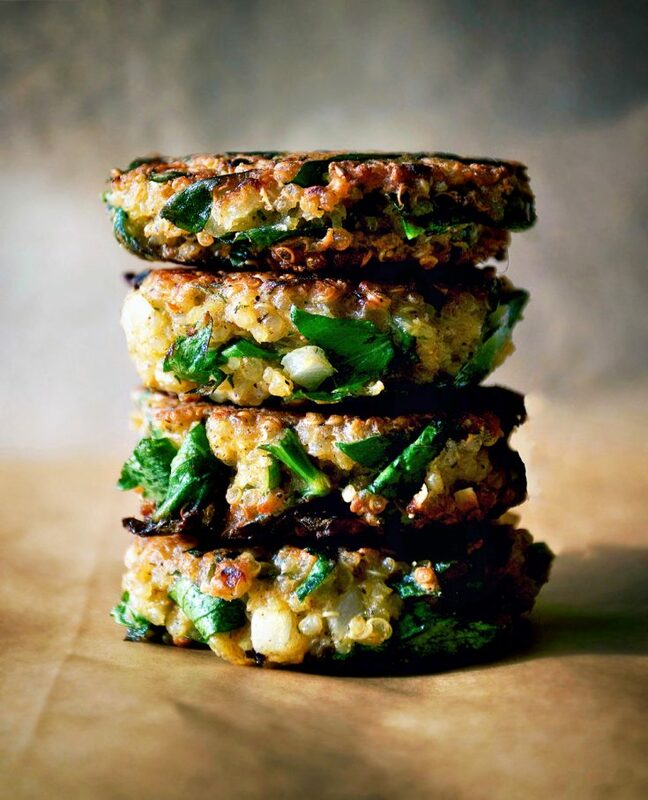 These vegetarian quinoa patties are loaded with greens like swiss chard (or any green, really) and parsley. Gluten free, dairy free, and very easy, these are a great quick dinner option. Mix all of the ingredients in a large bowl, making sure that they're thoroughly combined. Let the mixture sit for 15 minutes before cooking. Once the patty mixture has rested, heat a flat bottomed pan over low-medium heat. Shape small patties of the quinoa mixture, about 8 cm wide and 2 cm high. Fry a few at a time (don't crowd the pan) in a teaspoon of oil. Flip once the first side is golden and set on a plate while you finish cooking the other patties. Serve warm with the avocado tahini dip. They will keep well in the fridge for three days. Mash the avocado with a fork in a shallow bowl. Add the tahini, olive oil, lemon juice, herbs, maple syrup, salt, and pepper. Mix until smooth. Taste and add more lemon juice or salt if necessary. This will only keep for a day or so, but makes an excellent sandwich spread if you have leftovers. 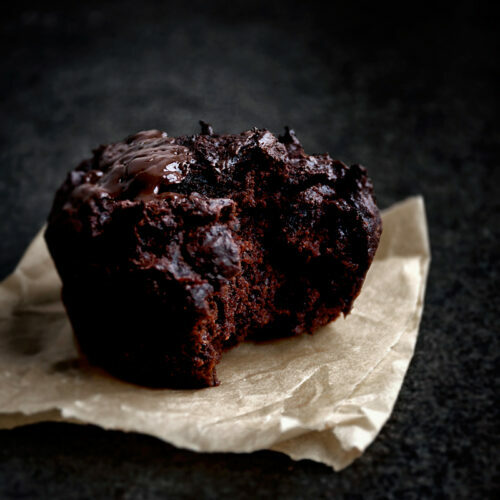 • I haven't tried baking these yet. I think it would work well though. * Any kind of leafy green will work here. Once, when desperate, I even tried them with celery leaves and it was delicious. These patties look so delicious and pretty! Your photo is perfect, btw. I was just trying to think of ways to use the swiss chard in my garden, so thanks for the inspiration. These look and sound delish! I truly hate when I'm amped up about a recipe, but feel as though the photos aren't good enough for a post. It makes me feel *so* defeated. I'm glad you decided to roll with this, though. The photos is fabulous — sometimes we're too critical of our own work! Can't escape that, I guess. Those sure look amazing! I am happy you decided to post it because I have never seed a patty quite like these. How do you think a flax egg would hold up? 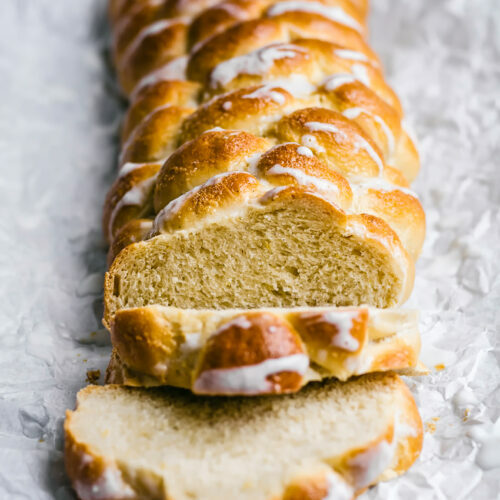 This recipe is so appealing to me! These patties–and that avocado dipping sauce! !–are exactly the kind of food I love to eat for lunch. They look great, seem nutritious and filling, and, seriously, that sauce! I have cooked quinoa in the fridge and now I know what I'll make with it. I've made a version of these patties before (from Heidi Swanson's Supernatural Every Day cookbook), and I loved them! They're delicious, not too complicated, and make such a versatile meal. But I love the idea of the dip you posted with these — sounds like it would take this recipe over the top. Thanks for the inspiration! I love the ease of this recipe — it's totally inspired me to get creative with a veggie burger patty of my own! Thanks for the delicious inspiration, Alexandra! Enjoy your family time and best of luck with the move. It's one of my favourites, too. Thanks, sweet lady! Ha, I'm only getting around to replying after all the big stuff is over, sorry! Thank you! 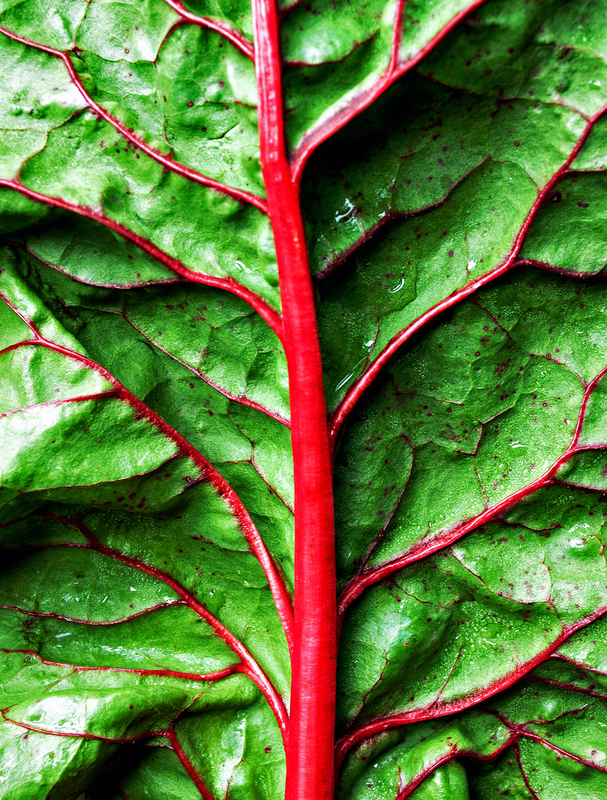 Chard's one of those vegetables that never seems to end in a garden, isn't it? I always end up looking forward to a hard frost so that it finally stops growing by the time the growing season is done! Thanks, Dana! I know, it's always such a disappointment when that happens. But I've had some of my favourite posts come out of taking pictures a second time, so sometimes it's not a terrible thing to reevaluate. Thanks! Hmm, I'm not sure, but I think it might. I hardly ever make flax eggs though, I just add the flax and rely on it to soak up some of the liquid that's already there, or add a little extra to help things along – I think I'd try a couple tablespoons and see how it goes, and you could always add more. If you do try it with flax, please let me know how it goes! Thank you, Hilary! Ooh, it makes a perfect addition to sandwiches! This is my favourite kind of lunch food, too. It's so portable, and I end up eating them cold as leftovers half the time anyway! Ooh, thank you so much, Marie! I love Heidi Swanson but I don't have that book – it's on my list, though. It's funny how that happens sometimes, isn't it? Hey! I just made these and they're so yummy. Thank you for the recipe. I used spinach because I couldn't find Swiss chard. I also ate mine with sliced tomatoes. You're so welcome, Melony! I'm happy you liked them 🙂 Sounds great! 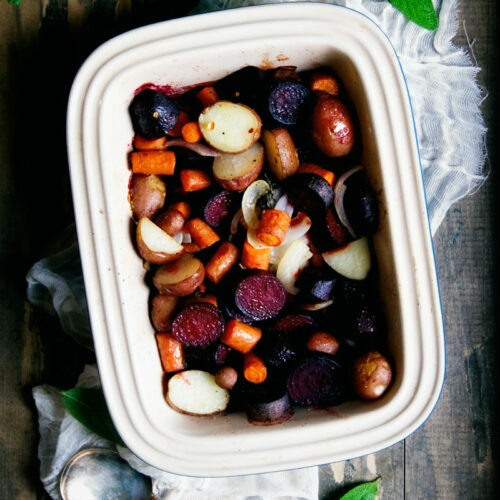 Stumbled to your Blog via Pinterest, I made the delicious potato & lentil dish yesterday evening… I am hoping to re-create it with new potatoes when we go camping at the weekend… I see (read) that you go camping, what food do you cook ? I'm looking for ideas that are easy… suggestions welcome. what can i use to substitute the egg? 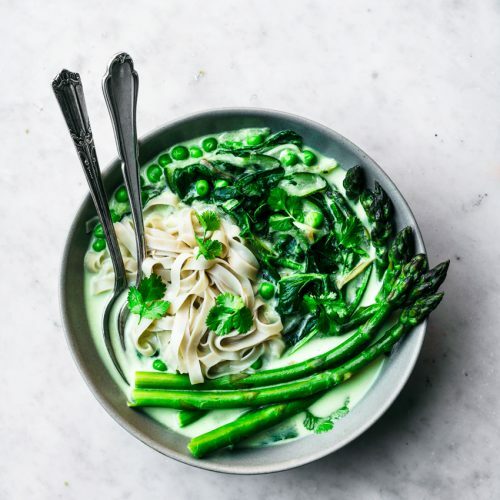 Hi Erica, I haven't had any success making this recipe vegan – if I had, I would have posted a version without eggs already. I have heard from other writers that aquafaba can be used instead of eggs in recipes like this but I haven't tried it. If you do, please let me know! Hi there! I always bring granola bars that won't crumble (usually my chewy granola bars in some variation) and I like to bring falafel and salads that can handle sitting for a day or two, like the potato salad or a quinoa or pasta salad. I usually bring nuts as an easy snack, oats and fruit to cook for breakfast, and hard fruits like apples, nut butter, crackers, hummus, and always watermelon! My boyfriend likes to pack one or two little bags of frozen fruit as ice packs and then tops our oatmeal with it too. I usually pack a denser muffin and also plenty of water just in case it's not potable at the site. Happy camping this summer! Oh no, I can't believe I hadn't caught that over a year later! It should say a half teaspoon, and I've updated the ingredients list now to reflect that. Thank you for letting me know and I hope you enjoy the recipe! Thx for the tomatoes idea. Making this tonight! a solid veggie burger, homemade, is like the dodo bird. near impossible to find. this is my new favorite meal. that avo dip is nutty good. speaking of, i swapped in half almond butter when i realized i had less tahini than i thought. prolly cuz i doubled the recipe which was a solid idea because there's lots of patties for leftovers. and the boyfriend eats a ton so now the avo dip won't disappear immediately. tonight i made your 'seedy buns' (swapped in chia/flaxseed on top cuz that's what i had on hand) to go with the veggie patty (above) leftovers. so excited. you have a big fan hear. love love love your blog. gamechanger. Bahaha I love your comments! I'm so happy you guys loved them and I can't believe you went so far back in the archives and made those seedy buns! These look amazing! I am always looking for ways to use up Swiss chard and this one totally works! The pictures look beautiful too!